You'll be £4.99 closer to your next £10.00 credit when you purchase Southern Thunder. What's this? During World War One the Scandinavian countries played a dangerous and sometimes questionable game; they proclaimed their neutrality but at the same time pitched the two warring sides against one another to protect their import and export trades. Germany relied on Sweden, Norway and Denmark for food and raw materials, while Britain needed to restrict the flow of these goods and claim them for herself. And so the battle for the North Sea began. The campaign was ferociously fought, with the Royal Navy forced to develop new tactical thinking, including convoy, to combat the U-boat threat. Many parts of Scandinavia considered that the War had 'missed' the region, and that it was just a distant 'southern thunder'; Much of that thunder was over the North Sea. This new book tells this little-known, and often ignored, story from both a naval and a political standpoint, revealing how each country, including the USA, tried to balance the needs of diplomacy with the necessities of naval warfare. Starting from the declaration of a British blockade and its impact and reception in Scandinavia, the narrative progresses to cover the struggle to prevent supplies reaching Germany, the negotiations to gain preferential British access to Scandinavian trade and the work of the sailors, both of the merchant marine and Royal Navy who had to make the system function. By the end of 1916, the British–Scandinavian trade was so important that a new system of convoyed vessels was developed, not without much Admiralty infighting, leading to the growth of naval operations all along the East Coast of Britain in places such as Immingham, Lerwick and Mehil. Two years later, the Germans, desperate to break the tightening stranglehold, even brought out their big-gun ships to hunt and disrupt the Scandinavian convoys, and at one point US Navy battleships were perilously close to engaging with the High Sea Fleet as a result. Detailed analysis and first-hand accounts of the fighting from those who took part create a vivid narrative that demonstrates how the Royal Navy helped to bring about Germany’s downfall and protect Britain’s vital Scandinavian supply lines. 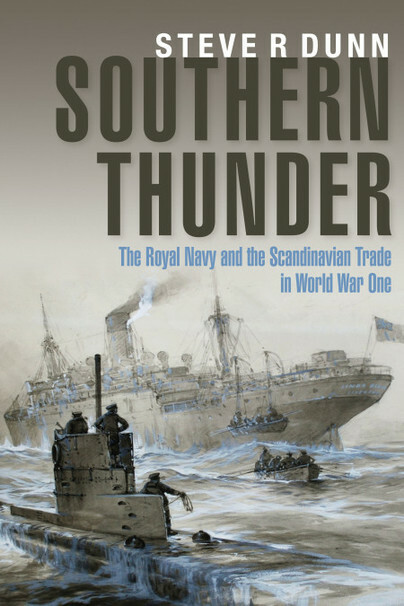 ‘Southern Thunder’ is a worthy treatment of this little-known, but intensely fought maritime campaign of a century passed. It contributes to the study of Royal Navy command and control in World War One. Author Steve R Dunn does a good job of explaining how the war in the North Sea developed, and uses a range of primary and secondary sources to describe the bitter conditions the Royal Navy crews had to endure and their bravery in protecting the convoys. Detailed analysis and first-hand accounts of the fighting from those who took part create a vivid narrative that demonstrates how the Royal Navy helped to bring about Germany's downfall and protect Britain's vital Scandinavian supply lines. Here yet again [Dunn] has created a fascinating tribute to those involved in another little-remembered theatre of the war. This book is very readable, well-written and researched, and may well become a standard reference work on its subject.